Ascension Lutheran encourages a holistic approach to Bible study and Christian catechesis. What this means is, we want to provide you with ways to hear, read, and learn Christ's Word at home, in study, and in worship. The starting point is home family devotions, created each week by Pastor Greg. Family devotions introduce the upcoming gospel reading with recitation of a creed, the Lord's Prayer, the Small Catechism, and the singing of a hymn. These elements then flow into Bible study and Sunday school, where we again hear the gospel reading and the catechism. The hope is that we might prepare for Sunday worship during the week so that we receive Christ with a repentant heart. 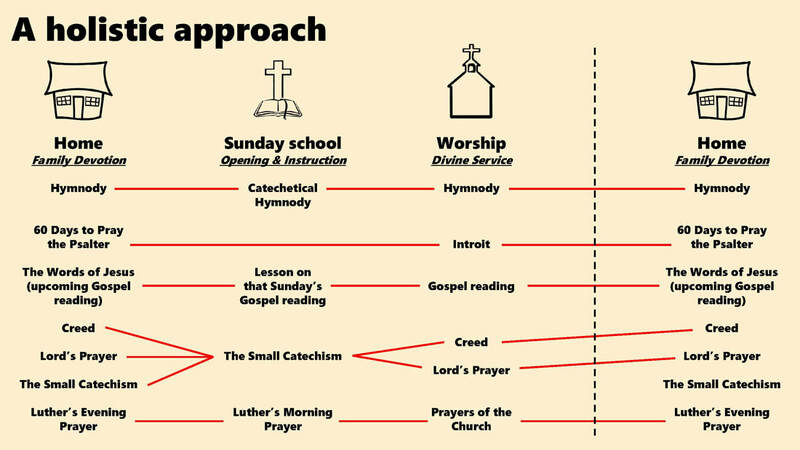 Please find below a presentation of this approach, as well as the schedule for Sunday school. We hope you can join us during the week as we grow together in Christ's Word!